Israeli soldiers attacked, Friday, the Great Return Match processions in the Gaza Strip, and wounded at least 40 Palestinians with live bullets. Media sources in Gaza said the soldiers fired dozens of live rounds and high-velocity gas bombs at the protesters, on Palestinian lands near the perimeter fence, along the eastern part of the besieged coastal region. The Palestinian Health Ministry in Gaza said the soldiers shot and seriously injured one Palestinian, east of Gaza city. It added that the soldiers also shot two Palestinians, in Jabalia, in the northern part of the coastal region. 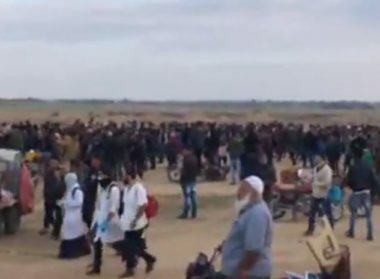 The army fired a barrage of live rounds, in addition to rubber-coated steel bullets and high-velocity gas bombs at the protesters, in addition to journalists and medics, especially when the army fired at the Great Return March encampment, east of Rafah, in the southern part of the Gaza Strip. On Friday morning, the soldiers fired many live rounds at Palestinians on their farmlands, east of al-Qarara, near Khan Younis, in southern Gaza Strip. The shots came from soldiers on military towers in Kissufim base, across the perimeter fence. Some of the wounded were moved to hospital and others were treated in the field hospitals, according to WAFA. More than 210 Palestinians have been killed and over 22,000 others injured by Israeli forces since the outbreak of the Great March of Return protests at Gaza border on March 30.